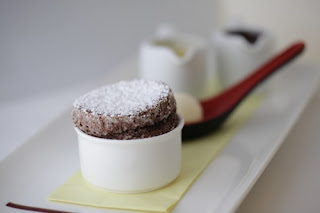 If you are dining at Palo on the Disney Cruise Line you'll want to try this sweet souffle. Serving Northern Italian cuisine, this adult exclusive restaurant is inspired by Venice with Venetian glass, wood paneling and a magnificent panoramic view of the ocean. Souffles can be sweet, like this recipe, or savory. It's a light baked cake made with egg yolks and beaten egg whites. This is one of the more difficult cooking methods to perfect but worth the work. Set a full kettle of water on to boil. Butter six 4-ounce soufflé cups and coat with sugar; set aside. Bring the milk to a boil in a small saucepan, meanwhile; melt the butter in a medium saucepan over medium heat. Add the flour and cocoa to the butter and beat with a whisk to a smooth, paste-like consistency. Reduce heat and cook for 1 minute. Slowly add the hot milk, whisking until smooth, then blend in melted chocolate. Let cool for 5 minutes, then stir in egg yolks. Beat egg whites in a separate bowl until frothy. Slowly add sugar, 1 tablespoon at a time, until stiff, glossy peaks form. Stir a heaping spoonful of egg whites into the chocolate, then fold in the remaining whites just until combined. Pour the batter into prepared soufflé cups. Place cups in a large baking dish and add enough boiling water to reach halfway the sides of the soufflé cups. Bake for 20 minutes. Serve immediately, with warm vanilla sauce. Bring cream and vanilla bean to a low boil in saucepan over medium heat. Add 2 spoonfuls of boiling cream to egg mixture and stir well, then pour back into the remaining cream and continue to cook over low heat, stirring constantly for 3 to 4 minutes, stirring constantly.